The invention herein disclosed relates to the pyrrolo-thiazole compound (MANIO), a new small molecule activator of wild-type and mutant p53 with potential use as anticancer therapeutic, with higher potency and selectivity to the p53 pathway compared to those on the market. The tumor suppressor p53 is an attractive anticancer therapeutic target because it can be functionally activated to eradicate tumors. As such, several compounds targeting the p53 pathway have emerged. In spite of this, more potent and selective pharmacological alternatives to the activation of p53 function for neoplastic cells are still largely required, specially avoiding deleterious adverse effects associated with many of the current cancer therapies. The possible identification of small-molecules that restore wild-type p53 function to a broad range of p53 mutants paved the way to a new class of anticancer agents more efficient in personalized therapy of cancer patients, and with low adverse effects on normal cells. 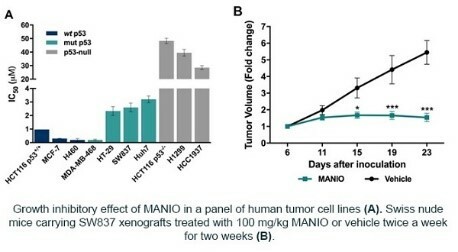 MANIO displays p53-dependent anti-proliferative effect on wild-type and mutant p53-expressing human cancer cells and in vivo antitumor activity, with no apparent toxic side effects. Moreover, it can be obtained from commercially available starting materials through a simple synthetic procedure. The compound can be used as a probe in the wild-type/mutant p53 pathway research field and as anticancer therapeutics after further development. TRL4 - technology validated in lab.